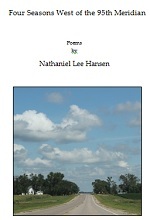 In February 2014, Spoon River Poetry Press published my chapbook, Four Seasons West of the 95th Meridian. You can order it via the website. If you happen to read it, feel free to rate (and review) it on Goodreads.